Weekend Quilting: Quilt and Unwind with Simple Designs to Sew in No Time is the wonderful new quilting book by talented West Australian quilter, Jemima Flendt from Tied with a Ribbon. I have been following Jemima’s quilting adventures for many years, and am so excited to be part of the Book Tour for her first book. 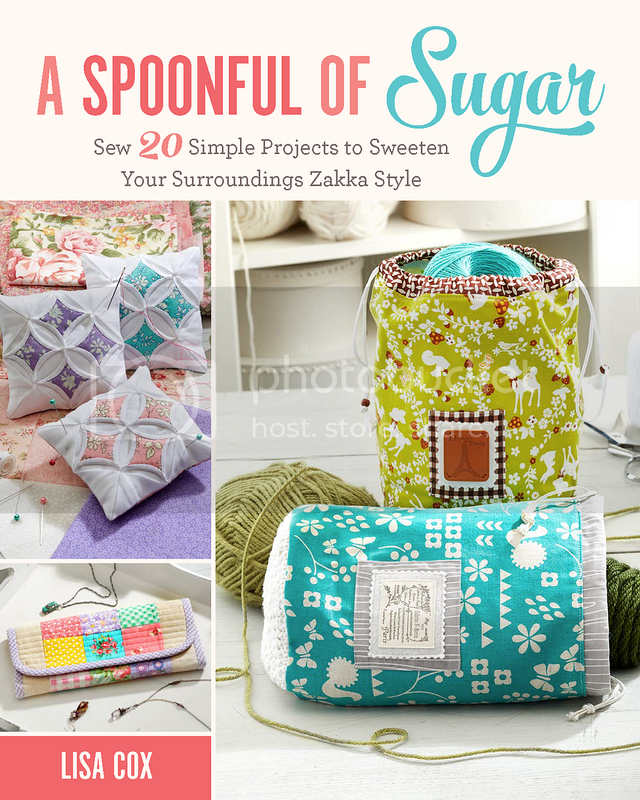 This lovely volume includes 16 clever projects to make pillows, mini quilts, table runners and more. The book is highly instructional, with each chapter covering a different technique. You can then put your skills into practice by making the projects that use that particular skillset. Whether it be English Paper Piecing, Pinwheels, Nine Patches, Foundation Paper Piecing, – Weekend Quilting will have your mastering a range of quilting techniques in next to no time! As someone who juggles work and family life, I don’t get much time to sew these days so I particularly enjoy projects that can be easily constructed in a weekend. Weekend Quilting will inspire you to get creative and many of the projects would make wonderful gifts. As part of the Book Showcase, I made one of the projects in the book, the Avenues Mini Quilt. The instructions were easy to follow, with lots of helpful diagrams and tips and tricks to achieve professional results. The book included templates for the foundation paper piecing. I made my project using Charleston and Les Petites fabric by Amy Sinibaldi for Art Gallery Fabrics. I resized the mini quilt so that it would fit on my pegboard which sits in my sewing room. I love the stripey binding. I added some printed tape from Daily Like that I found on my recent holiday to Seoul, South Korea. I love the message to “Find the Joy” – perfect words to live by. The backing fabric is Charleston The Row – perfect for this little mini with the row of houses and trees. Available from Ministry of Fabric. Fons & Porter are generously giving away a copy of Weekend Quilting to one lucky A Spoonful of Sugar reader. To enter, simply log into the rafflecopter giveaway box below with your email address or facebook account. Complete as many of the giveaway options as you wish – if you already follow A Spoonful of Sugar or Tied with a Ribbon on instagram etc, just click the button below for an automatic entry. Giveaway is open World Wide until June 10, 2017. The winner will be notified by email and announced here on this post. Good Luck! We hope you will follow along on the Weekend Quilting Blog Tour. Check out the stops below to see what these talented designers are making from Weekend Quilting and see more of the book. i love to make baby blankets – great weekend project! My favorite weekend sewing projects are zipper pouches. Whatever I am working at that time. I like to make bags or small projects that I can finish. It’s energizing to finish a project without months of work. I love to play with scraps and just sew mindlessly as I put them together. When I have a piece big enough, I use my template to cut out a bib front. I add a terry cloth back, and I have an adorable bib! Very cute mini, and I like the stripe binding too. Looks like an inspiring and useful book to have in one’s collection. I love your mini version – so cute!! I usually can get some ornaments or a lap quilt, baby quilt done. This looks like a great book to have for Christmas presents. Lately I’ve made zipper pouches and t-shirt quilts! Quick projects are the best, and that mini quilt is gorgeous. I like small, quick projects that can be completed in a few days. This book seems perfect. Thanks for the giveaway. Those little house are so cute! Would make a great quick gift! I have really enjoyed make a few decorative pillows along with my daughter for her bedroom. I love sewing along with her (most of the time)! I like to make bags or zippered pouches for quick weekend projects. Thanks for the great giveaway! I like to have something to embroider. Something with no deadline. I love to make short little projects. Baby quilts, table runners, pot holders, lol. Anything to just let the week go and is a fast finish. I like to try some small projects that I found during the week. Thanks for the give away. I love to make pillow covers on the weekend! Great book and full of inspiration! A must for my library! My favourite weekend project is a pincushion. I just sew what I’m working on!!! At the moment I am making zipper pouches, they are a great weekend project!! During the winter I make baby blankets with matching jackets and hats. During the summer I just make the jackets. Baby bibs and cushion covers are fun & quick. I like table toppers and mini quilts for my table stand. I like making small things and small bags. I like English Paper Piecing – it’s easy to pick up and put down as required. I like to do hand embroidery because I can take it outside with me. I enjoy making small projects on weekends…mini quilts, pillows, bags…that allows time for my garden too! I love making mini quilts!!! Love your mini! I love working on larger projects on the weekend because I usually have more time to sew. What ever I can, since with the kids on the weekend it is hard to sew, so generally small stuff. I like to work on small projects over the weekend, something that can be finished before I have to go back to work. Blocks, baby stuff, binding, etc. I am working on finishing a new quilt project–then back to some UFO’s! Adorable mini! I love to hand quilt. I love plugging away at my quilts! Any kind of small project – zipper pouches, totes, Tablet cover. I am teaching myself to quilt, so need all the help I can get. Love learning from generous teachers on the Internet. Thanks to you all. probably makeup bags–they’re a lot easier to make than some of the other things i’ve done! Thanks for the giveaway! I would love to win this book! Oops,I love making zipper bags. I like to work on baby quilts most of the time. I do most of my sewing and crochet on the weekend when I have my husband to help with the kids. I love pouches in general for a quick project! -cushions are my lod time classic… I just love them!!!! I love to make mug rugs or pouches! I can often try a new technique and still have a finished item at the end of the weekend. Mostly, whatever suits my fancy…………. I love to make zipper pouches and pincushions. I like to make a small project so it feels like I completed something. I love to finish up projects over a weekend! Love the foxy pillow. Just the book I need! My favorite weekend sewing project is mini quilts! I want this book so much!! Amazing projects!!!! I’m retired so every day is a weekend! I make mostly large quilts although I have a bunch of baby quilts that need making – for an October grandbaby. I love to make items for my nieces daughters. Children just love gifts, they’re so thankful. My favorite is probably pajama pants, because when the girls are only 6 and 7 the fabrics are so adorable. I love making a bag or zipper pouch on the weekend. It’s something I know I can finish! Little ruffle skirts. Only takes an hour or two and they look great.